These statement-making white columns create a grand master bedroom entrance. 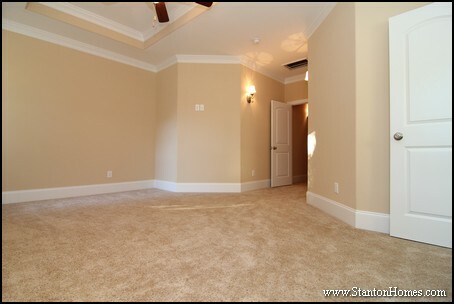 All major living areas - including the formal dining room - have clear lines of sight to the master bedroom entrance, guaranteeing attention to this upscale design choice. 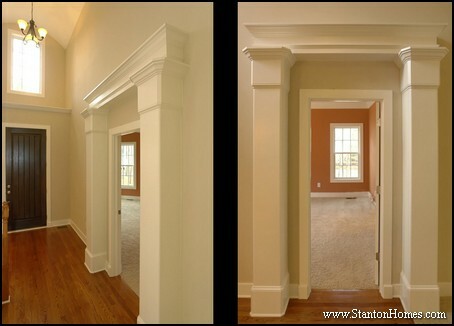 A framed entrance - sometimes called a "bump out" wall - can create a similar look to columns, while creating a more fluid appearance that blends the master bedroom entrance into the surrounding walls. 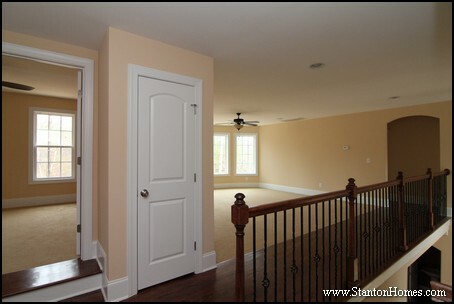 If you want your master bedroom door to be off-set from the living room, a short arched hallway entrance will give you plenty of separation between rooms. 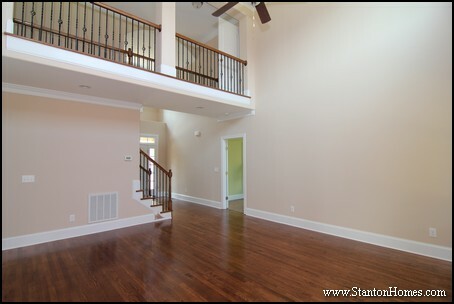 The staircase and master bedroom entrance are each hidden from view in this custom design/build floor plan. 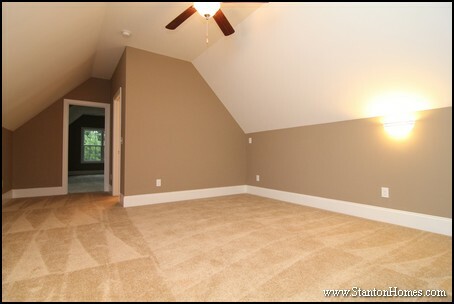 A private hallway leads to the entrance of this master bedroom. Since the master doorway is out of sight from all main living areas, subtle wall sconces highlight the suite from the inside. 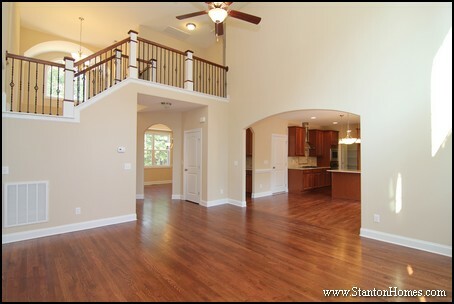 Here is the floor plan for this home - a version of the Sutherland, Alan Mascord floor plan design. 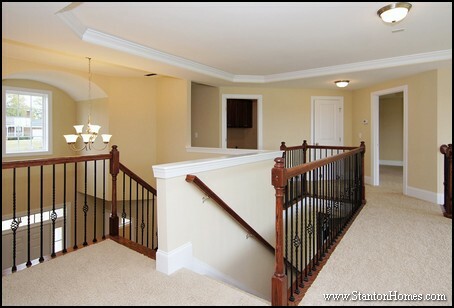 You can see how long this master bedroom hallway is, compared to master suites located just off the living room. 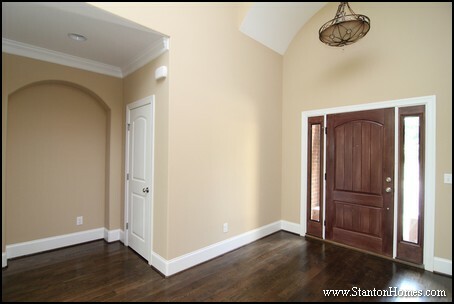 A custom barrel vault hallway leads the way to this master suite. 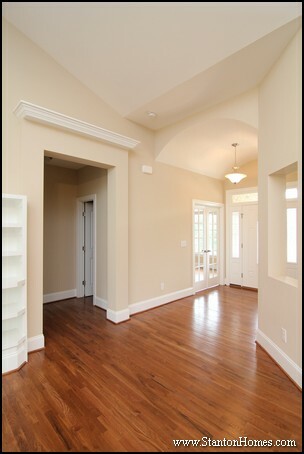 The hallway mimics the barrel vault foyer, creating an eye-pleasing continuity of design. 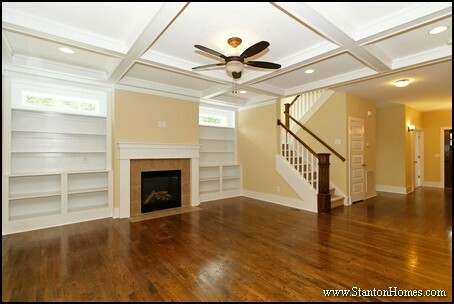 A two door design leads into this master bedroom - with a built-in art niche visible to the main living areas. 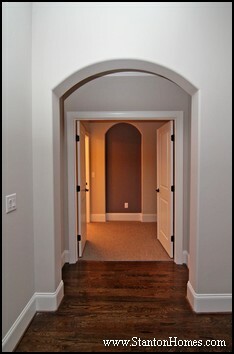 An arched entrance leads to a short hallway - creating a intricately beautiful entrance. 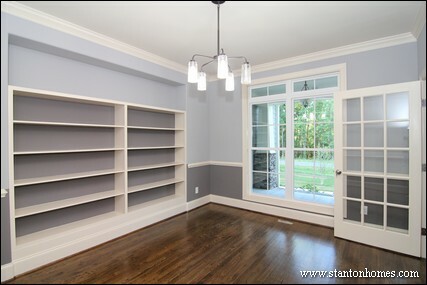 Just inside the master suite, an art niche is painted in an accent gray, to offset the arched detailing. While an art niche is located inside two of master suites above, this art nook takes center stage in the angled hallway leading to the master. 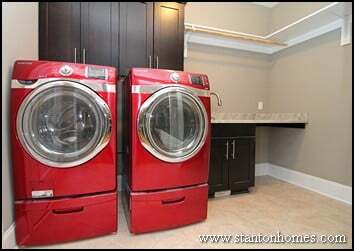 A second floor laundry room is a top request in homes with all bedrooms located upstairs. 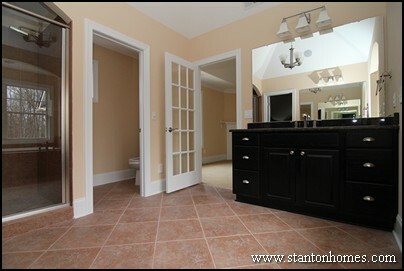 In this design/build Stanton Home, the master suite entrance is just feet from the laundry room, making your daily chores much easier. 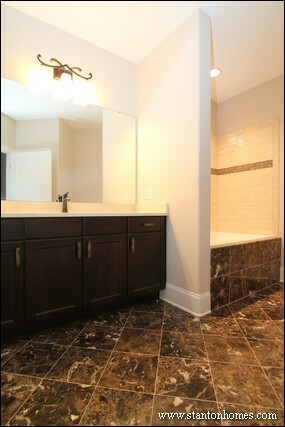 A portico-style entrance with hanging light leads to the master suite in this Raleigh custom home. 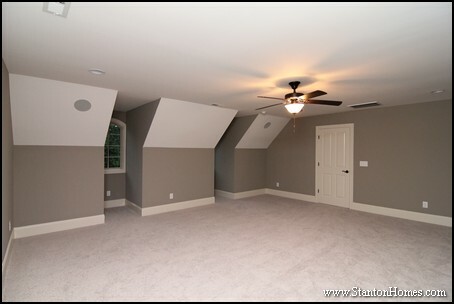 Varying your ceiling height is a design technique custom home builders use to subtly create more interest. 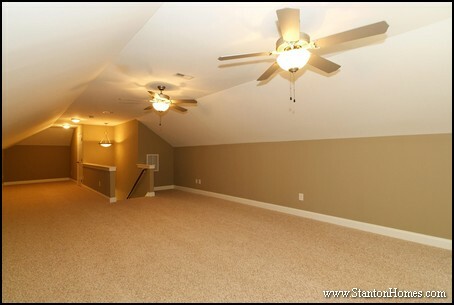 A raised ceiling on the first floor creates a step-up room on the second floor. 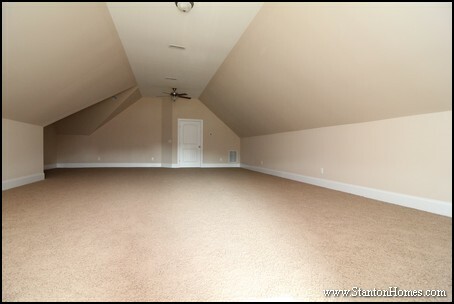 In this home, the master suite has a step up entry - making it stand out above the loft. 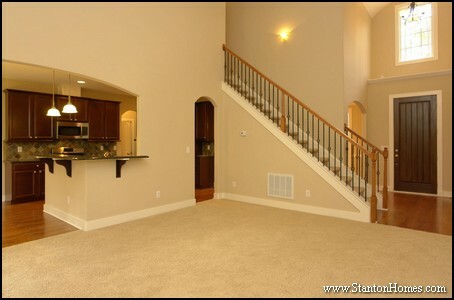 The hardwood step matches the staircase design. 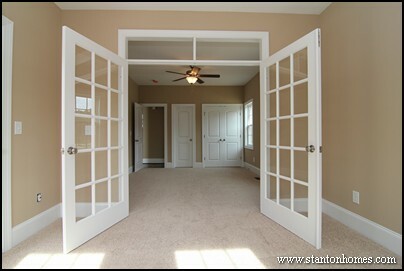 A single door entrance is a simpler design - often found in homes with the master suite located on the second floor - is ideal for those who want to de-emphasize the master suite location on the first floor. 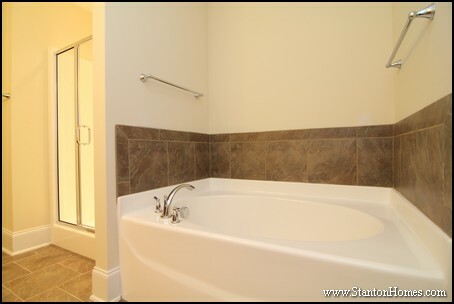 This master suite is fully handicapped accessible, with a widened doorway designed for easy wheelchair entry. 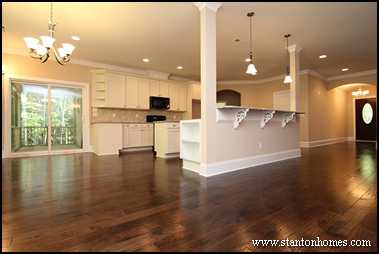 No matter what aging in place features you're looking for, Stanton Homes has the knowledge, expertise, and experience to build you a home to suit your lifestyle and needs. 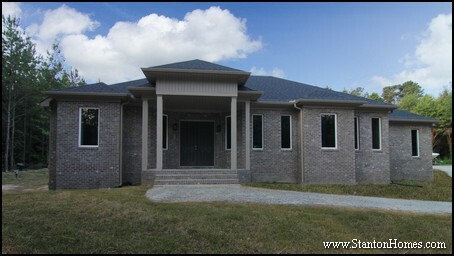 See photo galleries of Raleigh accessible homes - click here. 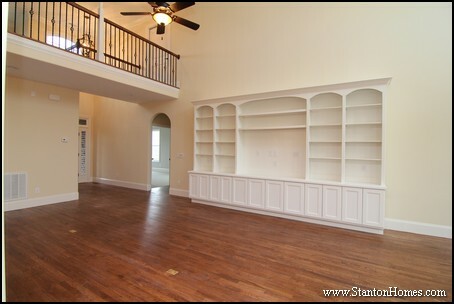 An arched opening leads to the master suite in this Frank Betz floor plan. 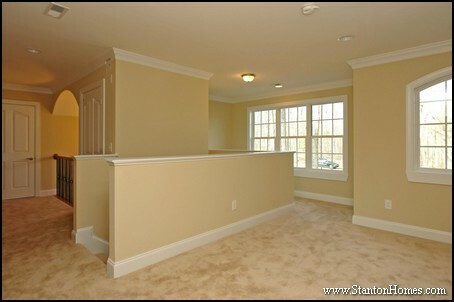 A small alcove hosts the master suite entrance and a built-in desk - each tucked out of view from central living areas. This modern floor plan design integrates work and home spaces - with the master bedroom just feet from a built-in work zone. 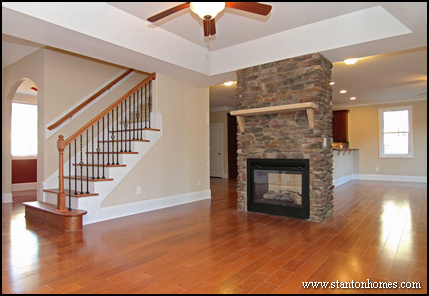 See examples of fireplace designs, functions, styles and locations below. Or click here to view over 80 fireplace design idea photos. 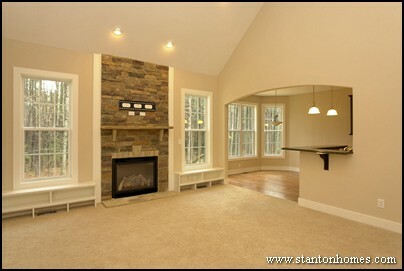 This three-sided fireplace is located centrally in the master suite - between the bedroom and bathroom. 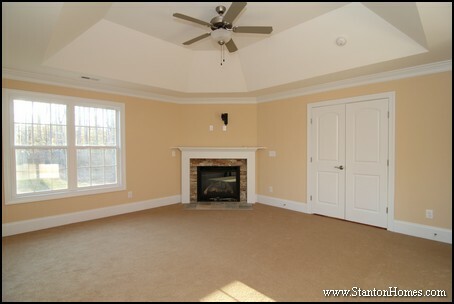 Cozy up by this master bedroom fireplace, complete with flat screen TV placement above. 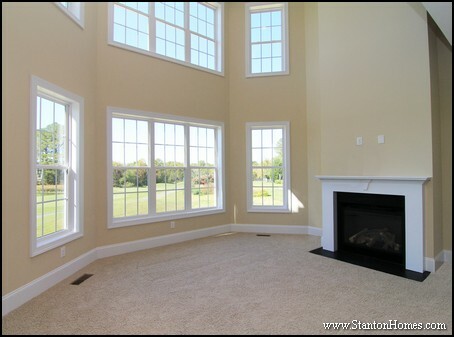 This sun room is designed as a year-round indoor/outdoor space, with a fireplace that will warm you up in the late fall and winter. 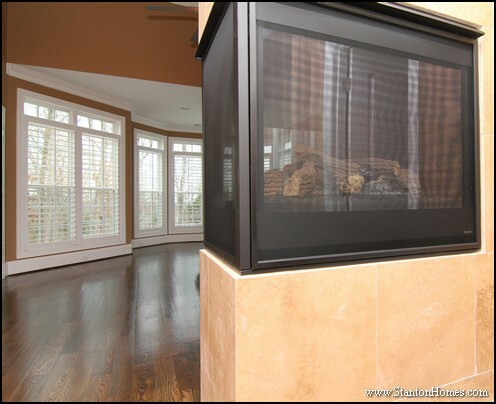 A sun room fireplace is a great location to draw in any outdoor design elements - such as matching the fireplace surround with the exterior stone walls. 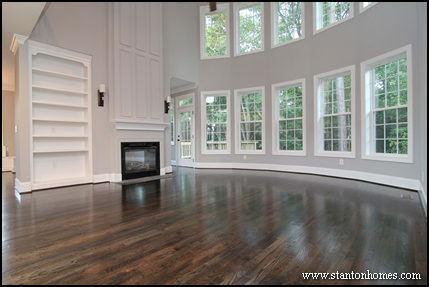 A two sided fireplace can help draw the sun room's light into the living room, creating a more open flow. 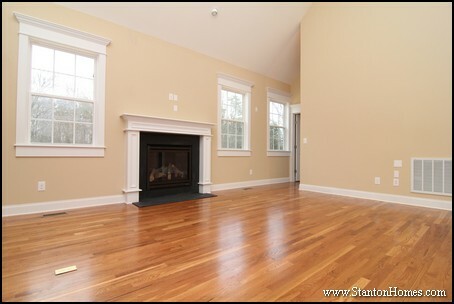 This living room designs offers ample built in storage, a flat screen TV set up, and wide open windows for natural light. 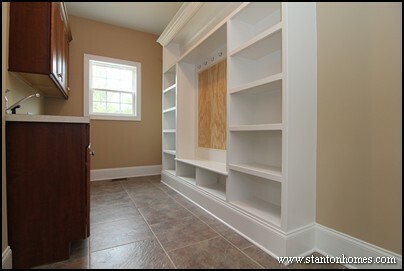 Adding storage around your fireplace is simple - see an example of full walls of built in shelving with cabinets below. 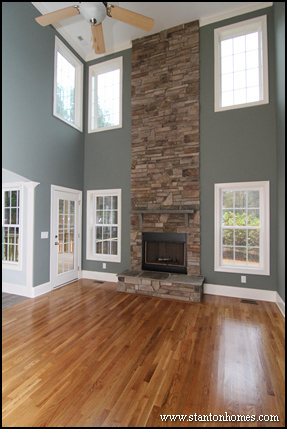 If your fireplace is located on an exterior wall, you may want to combine larger built ins with windows above. 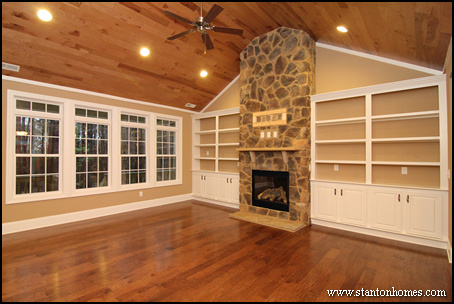 Here is an example of a craftsman style fireplace set-up, with windows and a set of large bookcases. 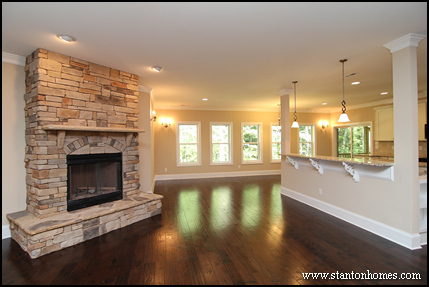 Craftsman touches punctuate this home, which boasts a full two story stone fireplace design complete with flagstone raised hearth. 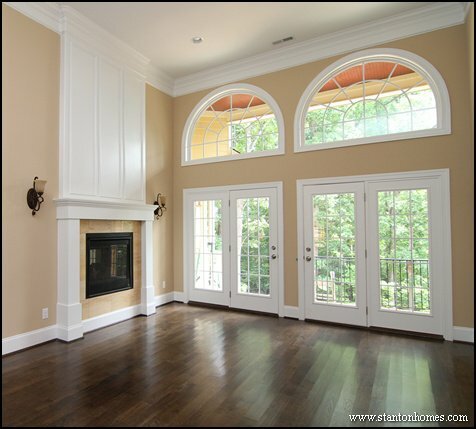 If your great room or living room features a vaulted ceiling - rather than a two story ceiling - a full height fireplace can make an equally dramatic statement, especially if you increase the surround width. 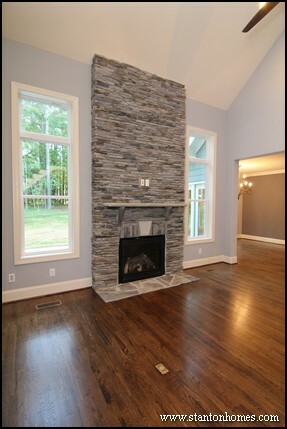 More Raleigh custom homes will consider fireplace positioning when creating the kitchen layout. Whether you want a fireplace in your kitchen - or one in a direct line of sight from your sink - these fireplace photos will inspire you. 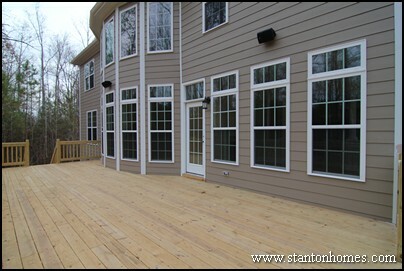 Take it outside, with a screen porch fireplace. 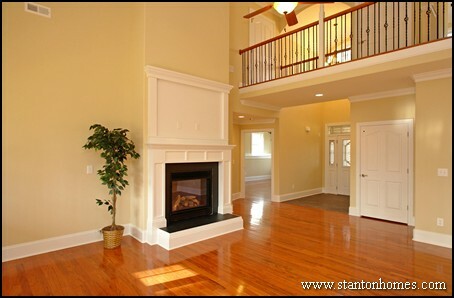 More new home buyers are making outdoor living spaces even more functional by adding a fireplace. 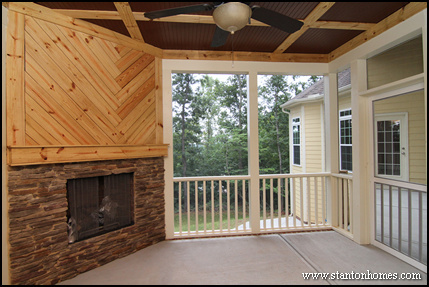 This screen porch fireplace features a custom wood herringbone design. 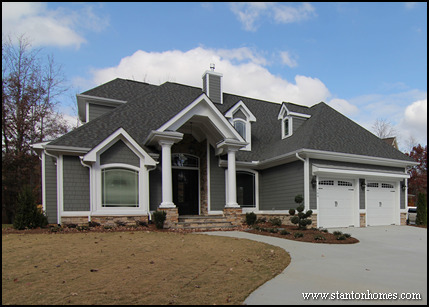 See new home exterior styles chosen by North Carolina home buyers - along with the most popular home exterior colors and features for 2014. 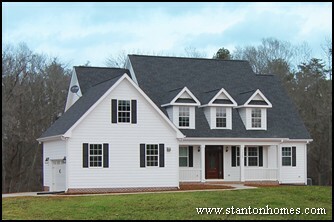 From craftsman and traditional styles to contemporary and victorian designs, you'll find photos of over a dozen different genres of home exterior design - built by Stanton Homes. 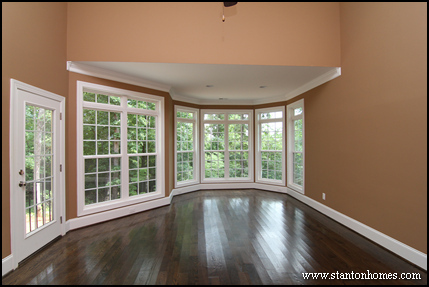 While some homes emphasize entirely traditional features true to a given genre, other homes are examples of how to select only particular features to represent an overall style. The architecture of craftsman homes evoke feelings of permanence, of time-honored traditions, and old-world workmanship. 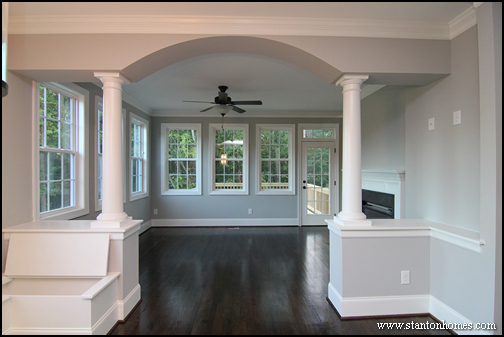 Simple lines inside and out, stone accents (front porches with stone base and tapered columns), and built-ins are a few characteristics. 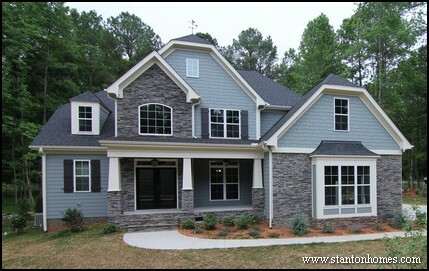 Craftsman style exteriors - or specific craftsman features such as stone column bases - are a top request for Raleigh new homes. 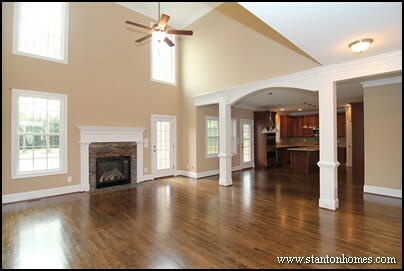 Transitional homes typically combine two or more major home design styles. In this photo, a version of The Bryson blends craftsman and modern-urban design features with white porch columns, white garage doors, dormers, and a stone water table. 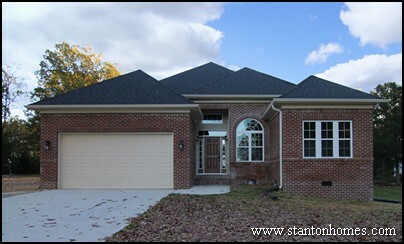 European home exteriors feature complex rooflines, stucco, brick and stone facing, and intricate window detailing. 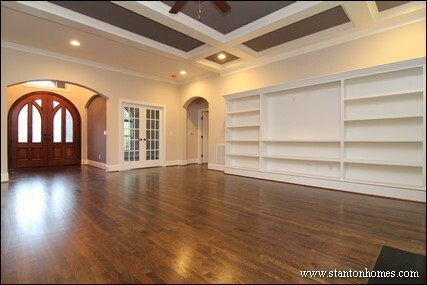 In this photo, a version of the Avonstone Manor floor plan by Garrell Associates incorporates medieval design with modern color schemes and details. 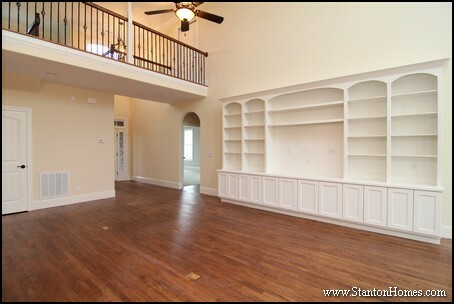 Country home floor plans strive for a comfortable, casual living experience. 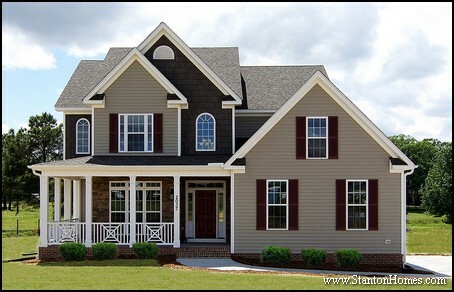 A few common features in country style homes are a welcoming large covered front porch or wrap-around porch, dormers on the second floor, symmetrical windows with shutters surrounding the front door, and vaulted rooms. 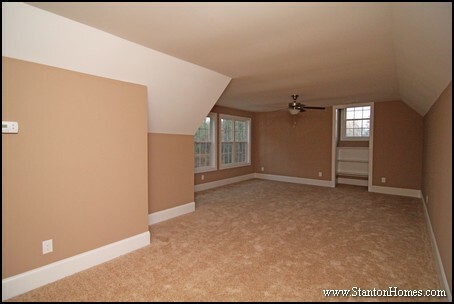 The Azalea Park - a Frank Betz floor plan - also features a country exterior. 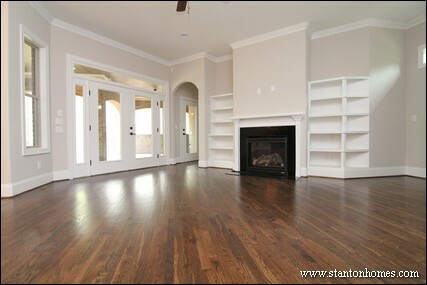 French Country homes incorporate rustic warmth with modern living must-haves. 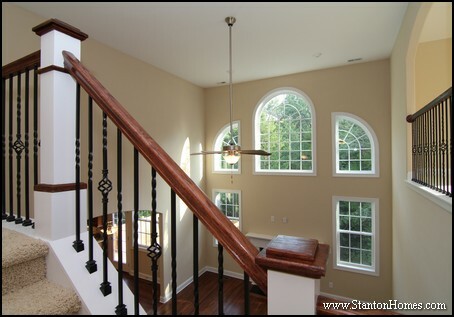 Exterior features often include curved arches, soft lines, and stone work. Inside French Country homes, you'll find wood beams - click here to see the wood beams in the kitchen of this custom French Country home. 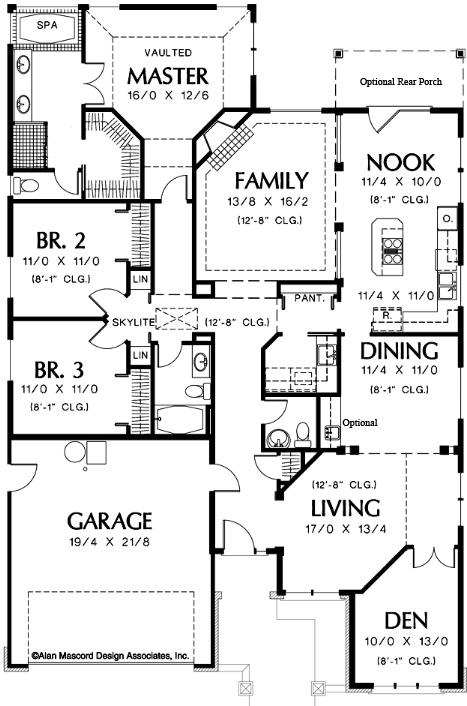 Country Farmhouse floor plans are designed with family spaces in mind. 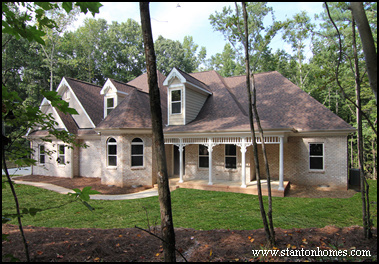 A large front porch for outdoor living and a second story with gables and dormers are typical design features. 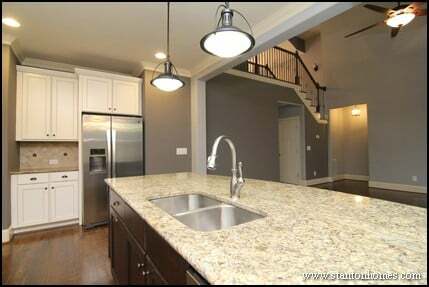 The farmhouse style exterior is complemented inside this home, which features a white and black kitchen with white apron front farmhouse sink, first floor master, first floor "home hub" for pets and kids, and upstairs bedrooms and flex space. 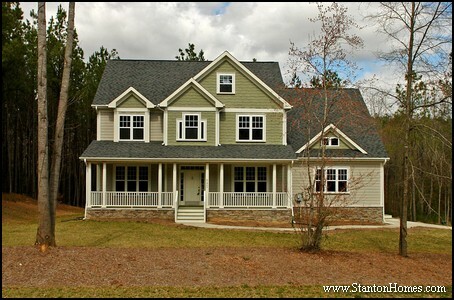 This two story home is a Frank Betz Cottage style house plan. A large wrap-around front poch, and unique roof lines, and wood detailing are typical for cottage home designs. 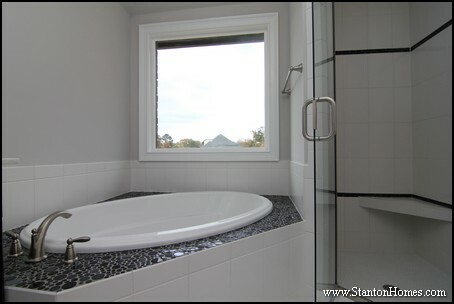 Inside, efficient use of space maximizes the usability of this home - which includes a first floor guest suite and second floor master bedroom. This custom home features the decorative flourishes of a Victorian style home - with intricate wood detailing in the dormers and along the porch ceiling. The bumped out turret room is another traditional Victorian home feature - along with intricate rooflines using turrets, towers, bays and eyebrow windows. 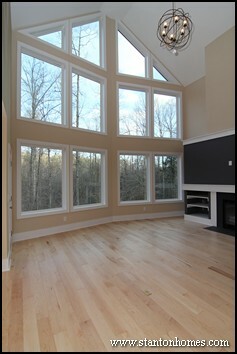 Lake House designs emphasize the connection between your home and its natural surroundings - with tons of windows and multiple outdoor living spaces. 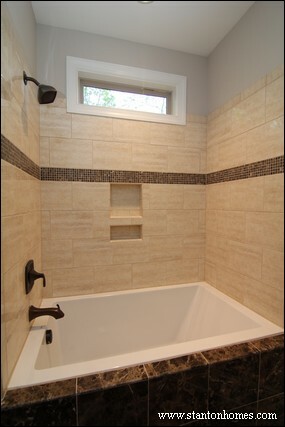 This custom home features Pennsylvania Field Stone accents. 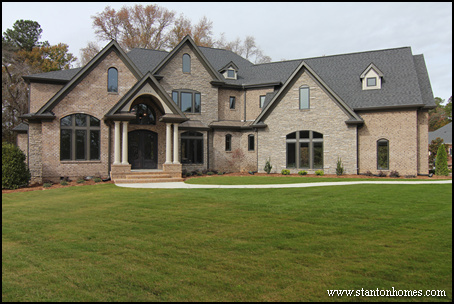 The style, size, color, and spacing of this stone front was considered - strengthening the connection between the home and surrounding nature. 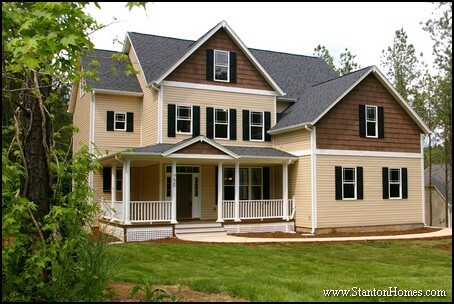 A Cape Cod style house plan is defined by: 1.5 stories (with the second story left unfinished in some cases for future expansion), main floor master bedroom, and additional bedrooms located on the second story. 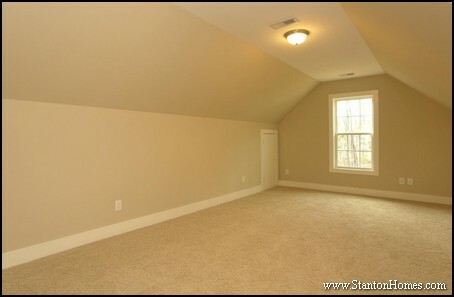 Cape Cod homes can have a large number of bedrooms for a given square footage. The exterior can feature dormers, symmetrical, "clean" exterior facade (number and placement of windows on each side of the front door) and little ornamentation, similarly symmetrical interior with a "center hall layout" and rooms to the sides. 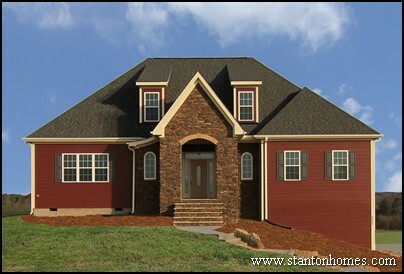 The exterior can be made of real (or simulated) wood shingles or clapboard siding. Traditional Cape Cod homes have a central chimney, steep piched roof, and end gables. 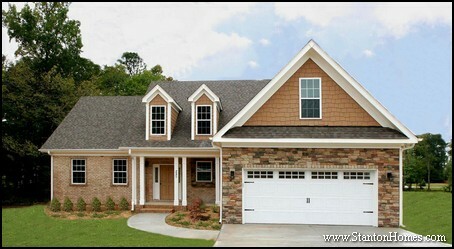 The Culverhouse is another example of a Cape Cod home design in Raleigh, NC. 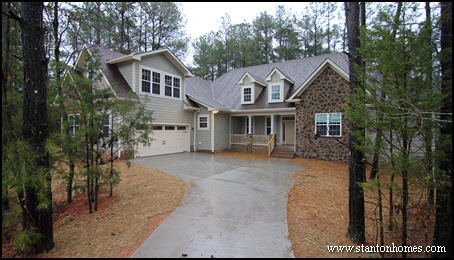 Bungalow style homes in North Carolina have some similiar features to craftsman style homes or prairie homes - with one or 1.5 stories, front door open to living room, open concept floor plans with little wasted space, and fewer formal areas are a few common features. 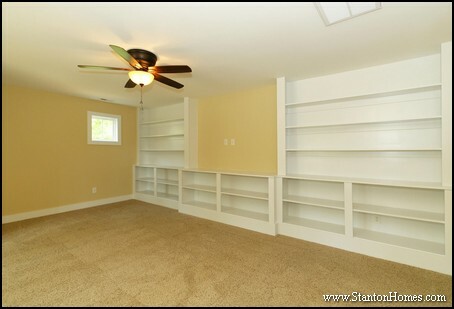 Bungalows may have similar layouts to ranch homes, which are one story and usually have a brick exterior. 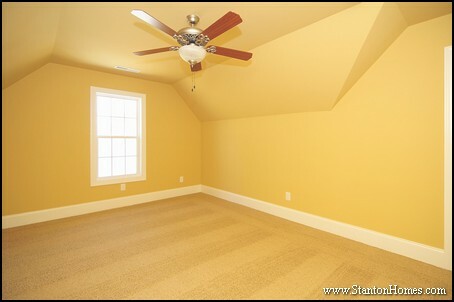 Traditional can refer several different design categories, such as Colonial, Cape Cod, and Ranch, depending on the region of the country. 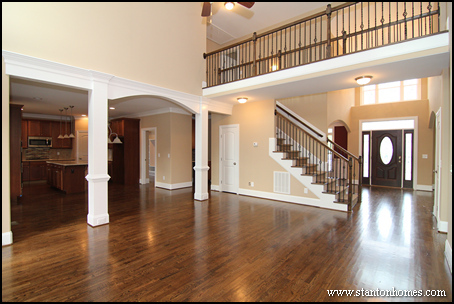 Traditional style homes are simplistic and symmetrical - and are usually two stories. 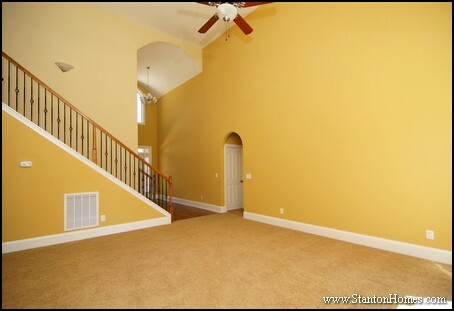 Contemporary is a very broad category. 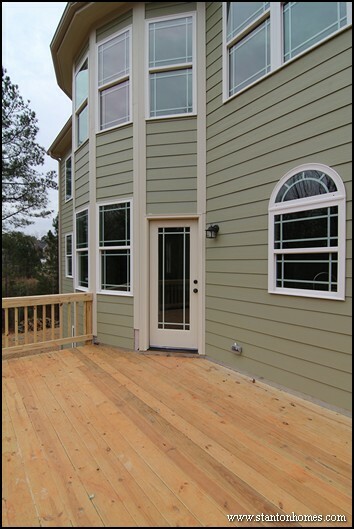 Contemporary style homes tend to emphasize bold shapes and colors, lots of glass (including windows without grids), contrasting features, and clear lines. 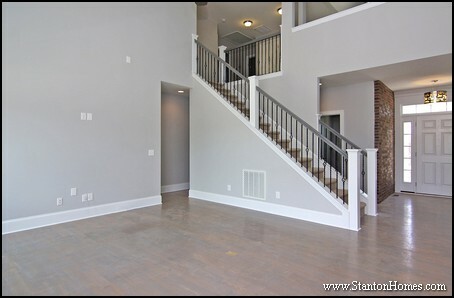 Many contemporary new homes in the Raleigh, NC area feature tones of grey, purple, and red. 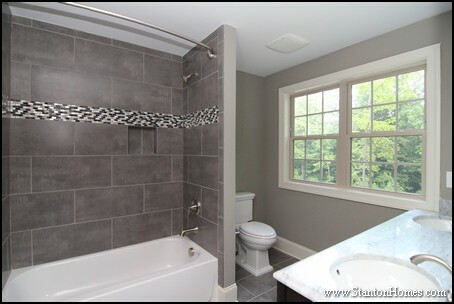 In 2014, we continue to see more blues, greys, and whites integrated into home exterior styles. 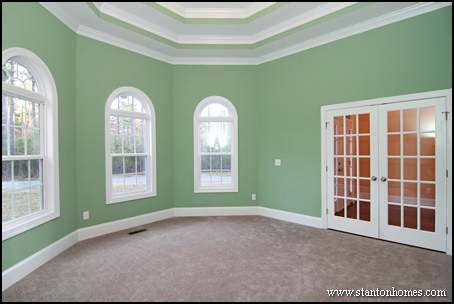 We will also continue to see shades of green - from light sage green to dark hunter green and red - with hues of berry. 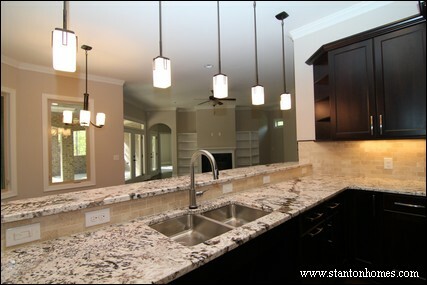 Kitchen lighting creates the atmosphere for the heart of your home. When choosing the lighting for your kitchen, one of the most important tips to keep in mind is to use a mixture of lighting types - including task lighting, accent lighting, and ambient lighting through decorative fixtures. 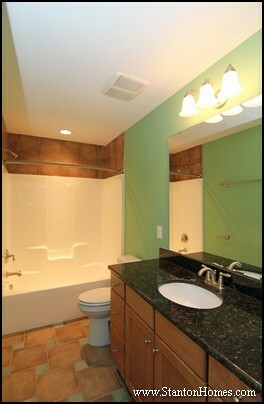 Each type of lighting provides a different level of brightness and a different type of functionality. 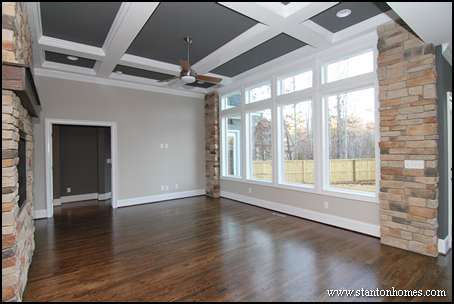 See how 2014 Raleigh new homes use different lighting types in the photos below. Task lighting is generally bright, focused, and essentail for illuminating spaces where you'll be completing cooking tasks such as chopping, slicing, or reading recipes. 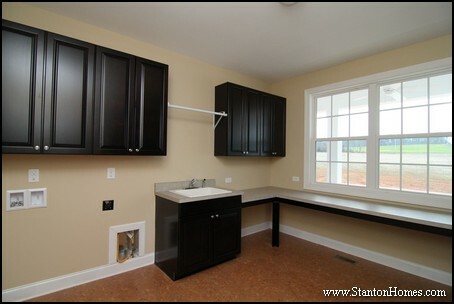 The best locations for task lighting include under cabinets, over the island, and in the pantry. 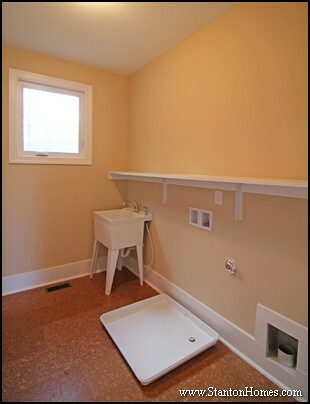 Under cabinet lighting is mostly commonly installed in long, linear strips. Each strip has a manual on / off switch, so you can choose to work in one area with the other sections turned off. 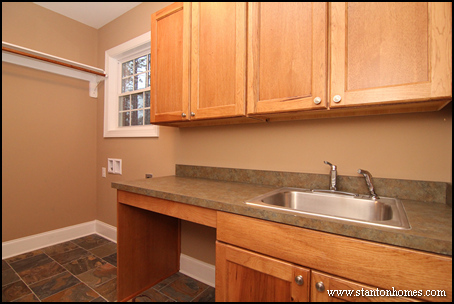 Under cabinet lighting is hidden from view, until you peak below the cabinets. 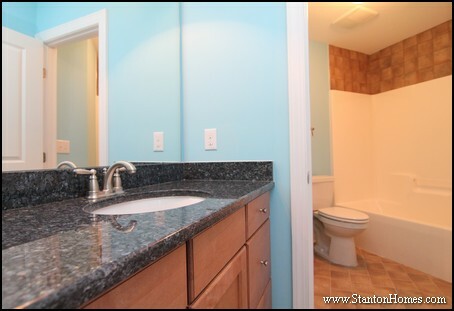 You can see strip under cabinet lights in the photo below. 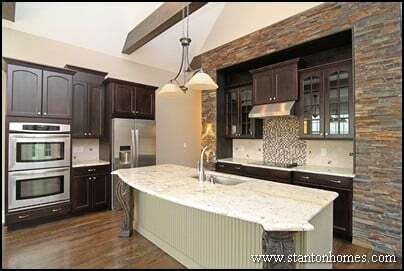 Kitchen pendant lighting is usually placed above the island or raised eating bar (for peninsula kitchens). 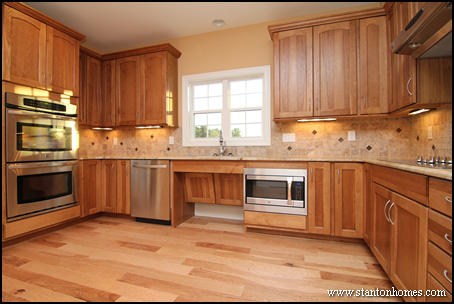 The number and spacing of pendants can vary widely, depending on the shape, size, and placement of your island. Pendants come as single hanging lights or multi-light strips. 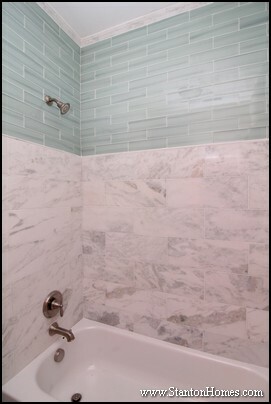 An example of a four light pendant is pictured below. This pendant features clear and etched opal glass around a mock-candle design. Multi-light pendants work best for long, stright islands. 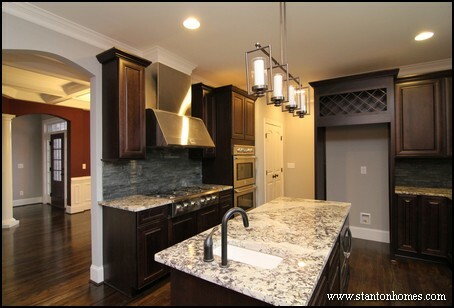 If you love angled island shapes, you'll want to place multiple single light pendants instead. 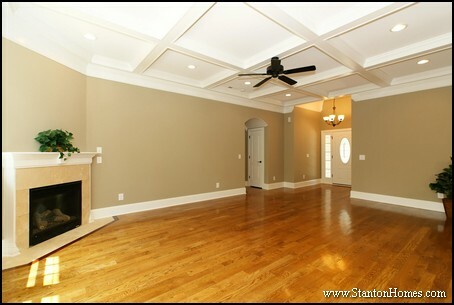 Single light pendants are can be more flexible in their placement. 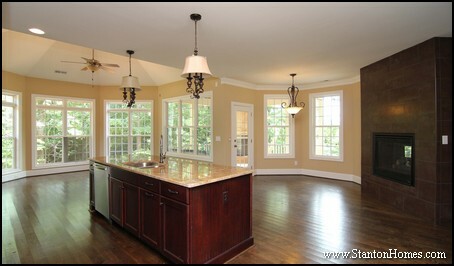 In the photo below of a Raleigh new home, you'll find an example of a kitchen that uses multiple pendant lights in a row, rather than a multi-light pendant. 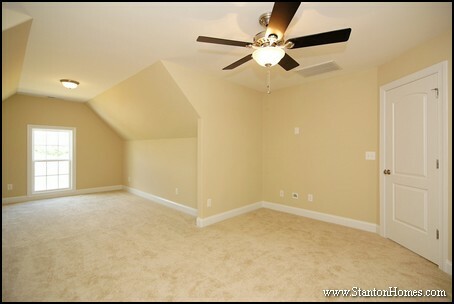 You can also compare and constrast the use of one or two large pendants with three to five small pendants. 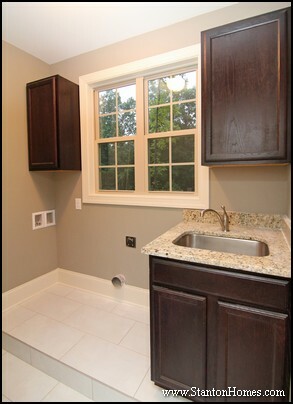 Some new home builders include a flush mount ceiling fixture in your kitchen (in place of recessed lighting) - typically a rectangular white flourescent ceiling light. 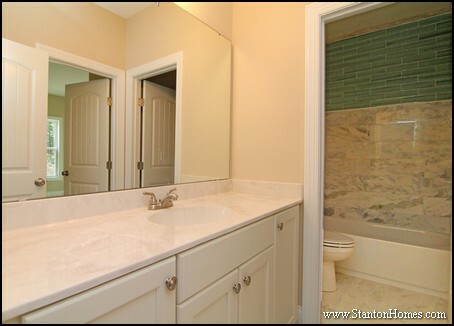 While recessed and pendant lighting are standard in all Stanton Homes, a flush mount ceiling fixture can be a more economically-friendly option if you're looking for ways to cut costs. If you're kitchen has an open concept design with lots of windows, there will be less need for additional lighting. Sometimes the best decision is to keep your lighting design simple - with ambient light from windows and flush mount can lighting in the ceiling. Depending on your kitchen size and layout, can lighting may be all you need to make your kitchen completely usable and efficient. 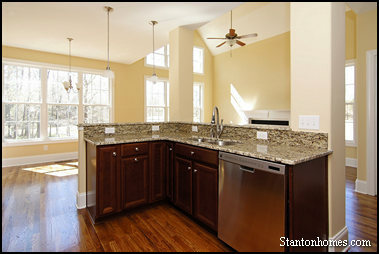 In this Raleigh new home, the kitchen uses can lighting, under cabinet lighting, pendants, and natural lighting from the breakfast and keeping room windows. 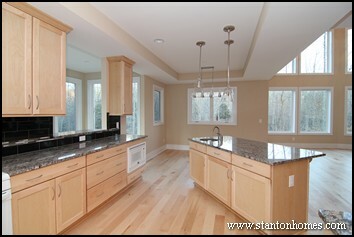 Design Tip: When choosing your kitchen lighting, keep in mind the long-held rule of "less is more."